Although seems like a coffee house from its name, it's far more than that and doubles up as a Pub & Bar and also a nice cozy restaurant that serves Malay & Western dishes. 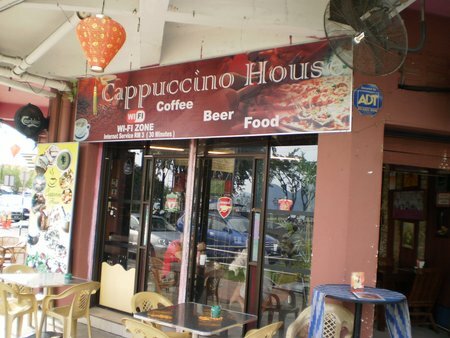 Cappuccino House is located quite centrally but at a corner of a street in Kuah Town. Having been to this place several times, I got a feel that it is patronized mostly by the locals and it has a typical guest profile who are matured adults. You will of course find younger people also moving in at times. With a stone & wood finished decor, the interior looks quite impressive and lively, and at the same time quite inviting and friendly. This is one of the very few places in Kuah which remains open till late hours and shows sports channels and movies on wide satellite screen TVs. 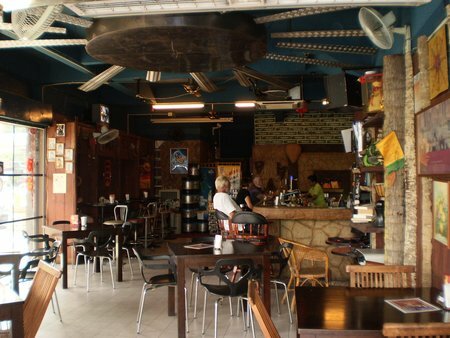 So if you are staying in Kuah and planning a night out, this is a cool place to come, have a drink or beverage of your choice, chat with the locals, watch sports channels and have a cool time. There is a large wide screen LCD screen right next to the bar counter. They also offer wi-fi service (RM3 per 30 minutes). If you are not carrying your own laptop, they can even offer a PC with internet access. There is a small outdoor patio outside where too you can sit and enjoy your own drink. Right outside the entrance, they will usually have a black board on a stand showing the day's specials. Depending on what might be on offer on the day, some of my own favorites here includes Dorry Fish Sandwich (RM 10.90), Sweet n Sour Prawns (RM 13.90) or Fish (RM 10.90), Ginger Chicken (RM 9.90) or Prawns (RM 13.90). But they do a have a range of other dishes in the menu. In appetizers you would have a choice of soups, salads and sandwiches. In rice items they offer Chicken or Prawn Fried Rice, Chicken or Prawn Sambal etc. In Snacks you have a choice of spring rolls, sausages, nuggets, Ikan Bilis (dried Anchovies fried in onion), French Fries etc. Additionally the menu also offers a range of Pasta and Pizza. There are also a range of non alcoholic beverages including fruit juices, ice creams, sodas and of course many different types of fresh coffees including Cappuccino for which it is so named. In coffee you will also get nicely done Latte, Macchiato, Expresso, Mocha and Americano etc. They also serve tea including green tea and Chinese tea here. However in Alcoholic beverages they serve only beer (of different makes and served really chilled). This is one of the very few places in Kuah where you will get Guinness Stout. You will also get makes like Tiger, Carlberg, Carona and others. Beer is very reasonably priced. A small bottle of Tiger would cost about RM4 and Carona RM9.